I’m not sure anyone enjoys cleaning toilets…if you know someone that does, please send them my way! Seriously, though…I hate cleaning toilets, so anything that makes it easier for me is great! I discovered an easy way to clean your toilet with only 3 ingredients and basically no effort. 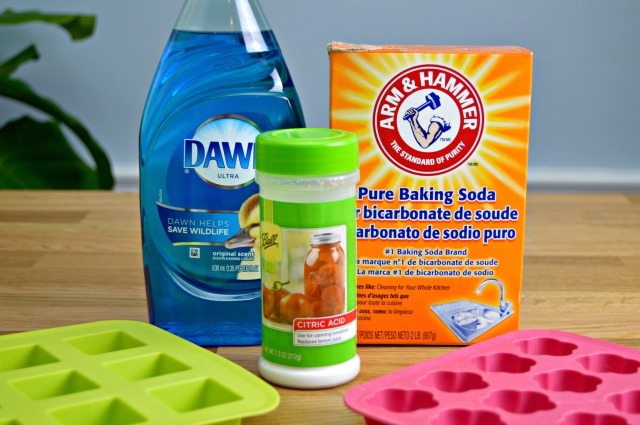 These homemade toilet cleaning bombs can be made with 3 household ingredients and will leave your toilet sparkling clean! The crazy thing is that I use the same recipe for my Homemade Dish Tablets, so they do double duty! 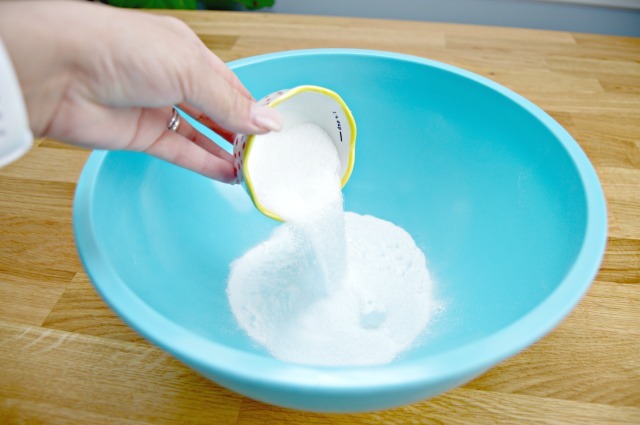 Add one cup of baking soda to a large bowl. Next, add 1/4 cup of Citric Acid. Squirt in 1 tablespoon of dish liquid…you can find my Homemade Dish Liquid Recipe HERE or you can use any dish liquid you like or have on hand! 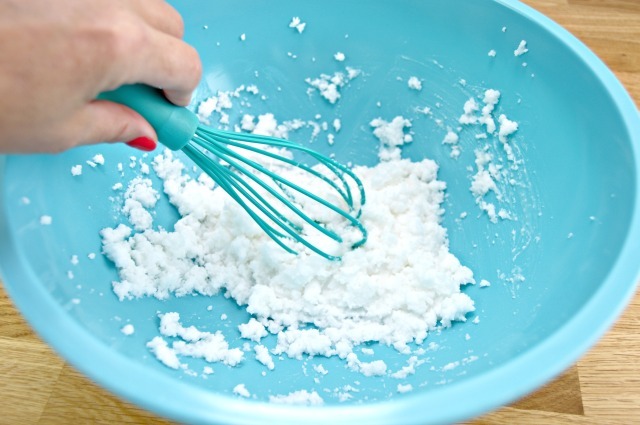 Mix together well using your hands, a spoon or a whisk. 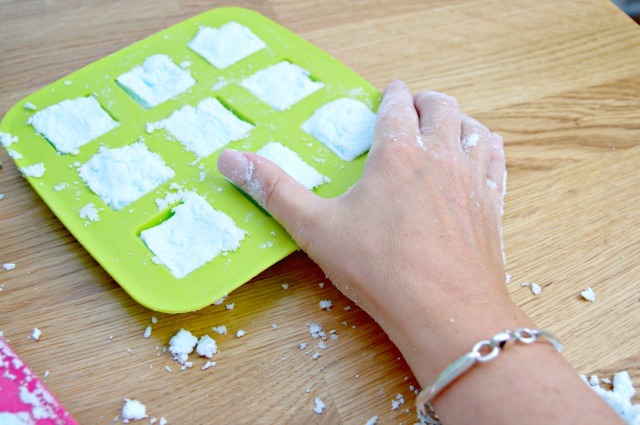 Now press the mixture into your silicone molds or an ice cube tray, making sure to wipe any excess away. ***PLEASE NOTE*** These will expand more if you use more liquid, and that is perfectly ok. Let them expand for a few moments, then wipe any excess away and use to fill your mold again. If you don’t have enough molds or ice cube trays to hold the extra, store the extra mixture in a sealed plastic bag until you can use to refill more of your molds. Expanding is absolutely normal. Let them dry for at least 4 hours or overnight. Once they are completely dry, gently pop them out and store in an airtight container. 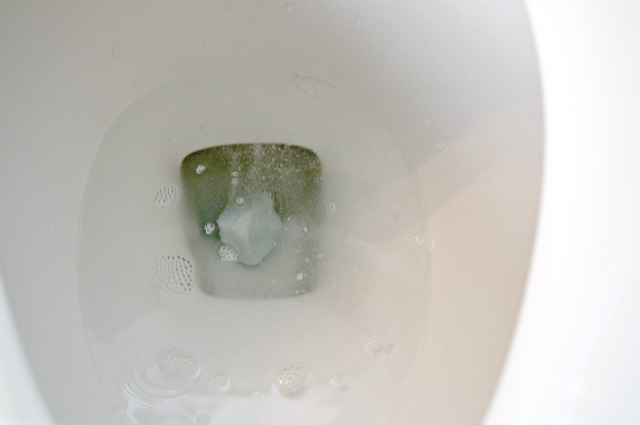 To clean and deodorize your toilet, simply toss a toilet bomb into your toilet bowl. It should start fizzing, which means your toilet cleaning bombs are doing their work! 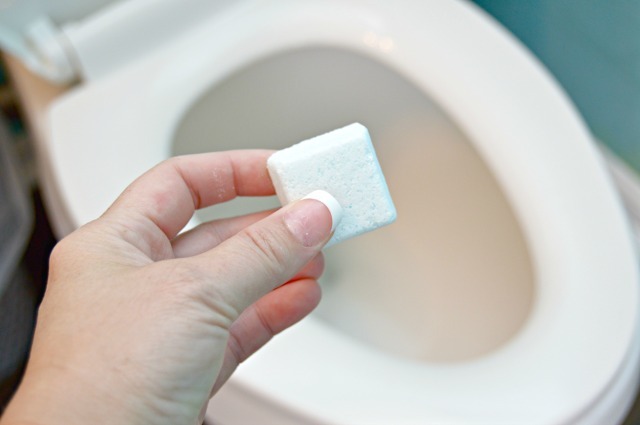 These homemade toilet cleaning bombs make toilet cleaning easy and hands free! You can find the cute Free Printable Cleaning Labels HERE if you’d like to use them on your homemade cleaners! 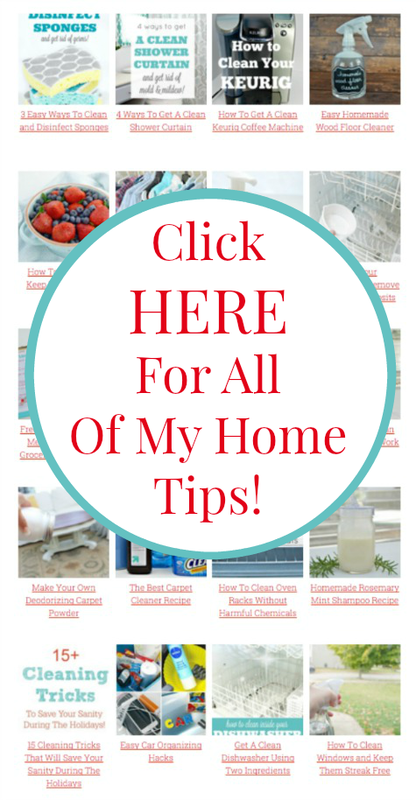 All of my home tips and cleaning hacks are easy to access too…they are all in one place on my Cleaning and Home Tips Page HERE! Where do you buy citric acid – thank you for all your helpful hints. Any grocery store. You use it for canning. I’m not really sure, but I would think so! Does this work for hard water stains or just basic simple cleaning? If you want to get fancy you can add grated orange or lemon rind. I also add a few drops of orange essential oil and a small handful of dried lavender. This works great. We have a septic system. I’m not sure how safe it is to use on septic systems but if you leave it soak over night and put a little elbow grease in scrubbing it the rust stains come out quite well. I’m hoping over time with scrubbing on a regular basis that the rust stains above the ring will come out but I think it is promising. We also have a dog who likes to drink out of the toilet bowl. I know. Gross! I feel a little better though using more natural ingredients than store bought cleaners with harsh ingredients that may have potential carcinogens in them. If this has citric acid, that should work on hard water stains as pure citric acid works to clean lime from your dishwasher. The product dishwasher magic is made of pure citric acid. @Phyllis, if you live in an area like that don’t have those items in any corner. Places that sell things to make candles and soap also sell citric acid. That where I go for mine. The Citric Avid is in your canning section. The link is live over the words Citric Acid. Just click it and it will bring you to Amazon where you can purchase it for only $2.97. eBay! I just bought 2# for $11 total. I got mine from a baking supplies store. You can buy it at Wal-Mart in the canning department. Got a big bag at Amazon too. I had to buy on Amazon! Hi, Justk wanted to ask where one can purchase citric acid? Thanks, and I’m looking forward to making and using your toilet bombs !;!! Mine foamed/expanded big time! What did I do wrong?!?! Mine expanded some too, that’s why you have to go back after a bit and run your hands across them. You can use the excess to make more if you like. We used to much Dawn. 2nd batch I used less then 1 tblsp of Dawn and a whisk, it worked perfectly this time. It’s the liquid when u added it. Need to pour it in as close to the dry products as possible. So the citric acid doesn’t activate. Also try filling two molds and pressing together like a bath bombs. Walmart also has it. You can find it by the jars for caning. Do you still use a toilet bowl scrubber to get areas the fizzy water doesn’t touch or will flushing mix all the water and remove stuff stuck towards the top of the bowl? I do every so often, but not as often now that I use the toilet bombs. That stuff doesn’t build up as much when using these. Hope this helps! Hi, Lisa! They are completely septic safe! Glad you asked! Is this the same recipe as the dishwashing tabs? If so, 2 for 1 :) just curious though! It is! A two for one…nothing better! the dishwashing tabs ? for dishwashers or hand washing ? Hi , I just made this recipe exactly as stated and when I attempt to put in silicon, the mixture just keeps puffing up out of the mold no matter how much I push it in it still puffs up out. What am I doing wrong? Hi, Brenda! Sometimes it does puff up a little, and it may depend on altitude…weird, right? Instead of trying to push them down, swipe the extra that puffs up off by sliding your fingers across and removing the excess. The excess mixture can be used in another mold. Hope this helps! Mine did the same the 1st time. I made a 2nd batch used alittle less Dawn and a wire wisk. I used a 6 cup cupcake pan with silicone liners. 1 batch make 6 perfect tablets and the popped right pout after they dried. I did put the pan in a plastic bag to dry. Will the toilet bomb help with hard water? Hi Jessica ! Thanks for the tip ! We need to read more about cleaning ! I saw a post on Pinterest about this. You turn off the water to the toilet then flush all the water out of the tank. Then, use duct tape over and cover the holes that the water comes out of tightly. Pour a quart or two of vinegar into the tank and push the flush handle which releases the vinegar into the holes. Let it sit overnight and remove duct tape – turn on the water and let the tank fill with water. Flush and swish. I have never tried this but this is the process I read about. Expanding once I pressed them in the silicone molds. Is that normal? Thanks and I love your blog! It’s definitely normal…once they expand, you should just wipe across the top and use the excess to make more. What is the yield from this quantity please? Do you know if you added a few drops of essential oils if it would affect the cleaning in any way? Thank you!! These are fantastic especially in my household of 4 boys! I don’t think it would hurt them at all! Yeah, boys = stink! Good luck! Will this work on well water. Such a struggle. Tried the recipe. Put one in a toilet as I was making them and it foamed like crazy. Put one in a toilet this morning and hardly any foaming. Baking soda settled to bottom of toilet and that was it. What did I do wrong? I’m not sure why they wouldn’t work for you…the citric acid should cause it to fiz once in the water. I also have same problem. Baking soda settled to bottom and not fiz at all. Are you using citric acid for “baking” or “cleaning” coz there is 2 type citric acid. I made these last night for the dishwasher (just saw the toilet cleaner tonight) Mine didn’t come out of the silicone tray very easy, some fell apart. I left them in freezer for about 13 hours. I smushed them back together and put back in freezer. When I pulled them out 5 hours later they still fell apart after sitting in a sealed jar for awhile. Placed them back in freezer, plan to leave them there until I need to use one. For those asking about where to get the Citric Acid, I found it int he bulk section at my store – it was in with the spices. I use more dish soap than the recipe calls for, which stops the crumbling. And these work great! Can this recipe be used for laundry also? Is this safe for septic? Jessica, I was wondering if one could use lemon juice in place of the citric acid instead? Hi, Nancy! I’m not sure it would harden as well or fizz because the citric acid is what makes it work, but you could give it a try in a small batch if you like. Great question! Could you add an essential oil, such as lemon? Or do you think it would not stick as good. You totally could…I would probably keep it to a minimum though, just in case! I tried making it several times at exact amount as your recipe, but why it won’t fizz? I have made the recipe exactly as written, but my bombs sat in the mold for 48 hours and they still have not hardened up. Any ideas? Mistyped above…I mean that citric acid is an acidic. If you find out what is really cleaning the toilet can you let us know? I’m thinking the acid is the better disinfectant and the baking soda is the abrasive. Dawn does everything well. I made your toilet bombs. They are amazing. I am going to make some more and give it as a gift to my parents. Thank you for sharing your recipe. I am currently waiting for them to set up still (fingers crossed they won’t crumble) but they smell so freaking good! I used Hawaiian Pineapple Dawn! ???? Ooooh…I will have to try that, Nancy! I bet it smells amazing! It really does smell good! Sadly, it loses its scent quickly after they harden up. I don’t think they are working like they should be, though. They don’t fizz a whole lot at all, they kinda of slowly disapparate. How does it clean the entire bowl? It will clean where the water level is but that’s only a small part of the problem. Most of the odors and mold come from above water level and around the rim. Have any of you taken a rag and cleaned up under the rim of the toilet? If not done regularly it gets really gross and these bombs won’t clean that. That’s were the brush is needed. The reason it expands in your molds is too much moisture makes the citrus acid & baking soda react early. 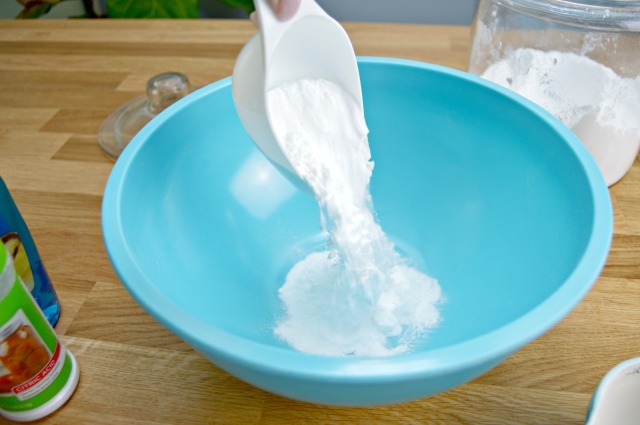 Your mixture is simply too wet & your finished product will never fizz as much as they are suppose to. Try adding the dawn a little at a time & when your mixture starts holding together like wet sand stop & add no more Dawn. 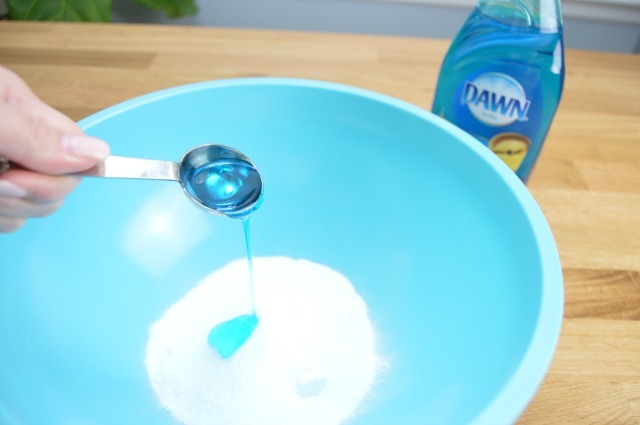 Use the recipes 2 tablespoons of Dawn as a guideline only. Differences in climates make that necessary. It’s tricky but with practice you will know when your mixture is just right. Just read most instructions for bath bombs & you’ll learn to get the combo right. Also never make them on a rainy day or your recipe will fail as well. In fact you can do everything perfectly but if your humidity is too high they are going to react prematuringly. Thanks for the recipe. I’ve never seen Dawn as the wet ingredient before but why not. I’ve used washing soda powder & Kaolin Clay along with the necessary baking soda & citrus acid with fragrance oil & colorant as my wet ingredient along with a spray bottle of Witch Hazel or alcohol for additional wetting. Small amount of Kaolin Clay makes your product harder. I’ll have to try your recipe as well as it seems so much easier. The end result is what’s important. Can you add any sort of essential oils to the bombs? Is the dish soap really safe the the dishwasher, I’ve had bad accident with accidently using dish soap in the dishwasher and it foams badly. In the comments above, she stated it was for dishwashing not the dishwasher. You can but ascorbic powder at bulk stores and all natural or Amish stores.much better buy. I am making them and using MINI cupcake pan. the small liners are with them so I used them too. Mine is very dry . What is up ? Hi, Julissa! They should hold up great! How often do you use the toilet bombs and are they suppose to fizz up like a bath bomb? So as these bombs were drying they really puffed up. Should I tamp them back down? The probably had doubled in size. You should scrape the excess away after they rise and use it to make more. Hope this helps! Hi. Can I use vinegar instead of citric acid. Why did mine exams after I put them in the molds? Instead of putting my toilet bombs into the bowl, I put it into the cistern and it seems to work much better this way. Mine expanded as soon as I put it in the moulds so I think next time I might make sure I really mix the bicarb and citric acid well before adding the detergent. Question: are the toilet bombs safe for septic systems? BTW, I love your website!!! Hi, Tonda! Thanks for the kind words, and yes…they are safe for septic systems! 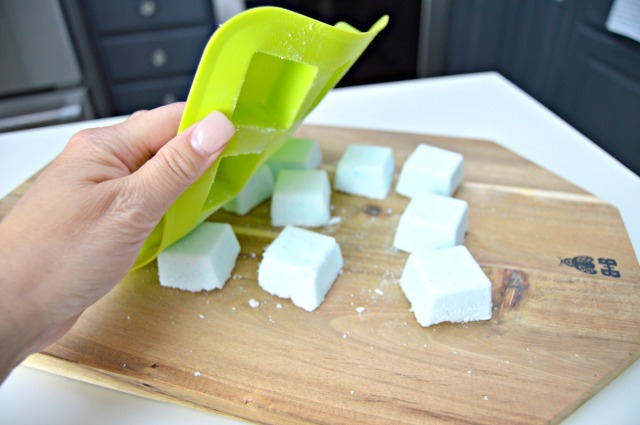 I love these thank you soooooo much for sharing they are so easy to make and where a great addition as I’ve jyst deepest cleaned my toilets to remove all the stains and lime scale so this is making maintaining a really easy job ???? Hi, where can you find the silicone ice trays/molds?? You can find them in most grocery stores now or you can purchase them on Amazon. I’ve also picked up a few at IKEA. They are usually found in the kitchen section. Hope this helps! Wow! this is really a toilet cleaning bomb. Going to give it a try for sure. Thank you for sharing. Hi! I followed the directions exactly but they keep foaming up in my ice cube tray. I keep wiping away the excess but it keeps foaming over the sides. Why is that? Does it help with bacteria? Does this cleaning method kill germs? Can I just store the mixture in a air tight container without molding it? Mine did not bind together at all. I did add a little water to get it to hold together. Does anyone have suggestions or have this happen ? Can u use this if you have a septic tank? Mine crumbled when I took them out of the mold, what did I do wrong? I put some of the surviving pieces in the toilet, hardly any fizz, can baking soda or citric acid go bad with age? Just mixed up your 3 ingredient toilet cleaning bombs. Mine are swelling up?? Do you know why?